* The current version of this App does not support iOS 8. We are looking into this issue and will upadte the description when we have more information. Play Games and Learn a New Language! 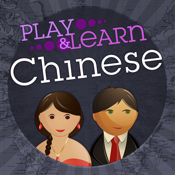 With over 700 words and phrases, Play & Learn Chinese is the fast, fun, and friendly way to learn to speak Chinese! 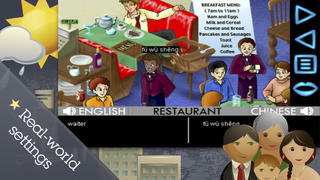 Enjoy fun "find it" games and immersive learning environments as you listen to and speak aloud Chinese words and phrases. Explore realistic settings such as a supermarket or a restaurant, then see how high you can score by finding the pictures to match the words you hear. You’ll be surprised by how much Chinese you’ve learned while you play! Play & Learn Chinese is easy and effective for beginners and travelers and a fun refresher for advanced and intermediate speakers. • Subjects and situations include city streets, restaurant, supermarket, classroom, doctor's office, home, family, and more. • Family Album: Learn the most commonly used terms to address family members and relatives. Also available in HD on iPad!